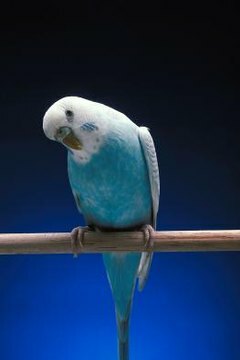 Budgerigars are playful birds. Captive budgies like to occupy themselves by playing with toys. They need a variety of toys; otherwise they become bored quickly. But purchasing toys for your birds can become expensive. Instead of taking frequent trips to the pet store for new toys, make some of your own using items found around your house. Popcorn strings aren't just for decorating Christmas trees. Your budgie would love to play with and chew on popcorn. Use a needle tied to a cotton string to spear 10 or 15 pieces of popcorn onto the string, then remove the needle and tie a knot at each end to keep the popcorn on. Plain popcorn is healthiest for your budgie. Hang the popcorn string in his cage or in a designated play area, and let the chewing begin. To make a toilet paper roll toy, you need scissors, one cardboard toilet paper core, several inches of cotton string and a handful of beads of different sizes. Cut the toilet paper roll into thirds so that you have three mini-rolls. About an inch from the end of the string, tie a knot. Poke two holes through opposite sides of each of the three mini-rolls. Slip the string through one hole in one of the mini-rolls, through the hollow center and through the other hole. Slide the mini-roll up the string to the knot. Slide four or five beads onto the string, the final bead larger than the others, then slide on another cardboard mini-roll, then more beads. Repeat until you are out of rolls, then place a final large bead and tie a knot to finish the toy. Hang the completed toy in your budgie's cage. Your budgie will love spinning the beads around and chewing on the cardboard rolls. For more fun, attach a bell to the end of the toy. Obtain an empty egg carton. You will only need to use only the back row of egg holders, the row attached to the hinged top. Close the carton with its tabs secure so the top and bottom of the carton are connected. Use a pair of scissors to separate the egg holders from each other, being careful to leave the backs connected so that the top and the bottom pieces are still attached to each other. Once finished cutting, you will have six top and bottom pieces joined together by a hinge. Place a few of your budgie's favorite edibles into one of the carton pieces, close it up and place it in his cage or on his play gym. Your budgie will be pleasantly surprised when he chews through the carton and discovers a special treat inside. Give your budgie a six-legged critter to play with. To make a beaded spider, you need seven equal-length pieces of leather string measuring at least 5 inches each, and at least 30 beads. Tie knots 1 inch from the top and the bottom of one leather string. This piece will be the body of the spider. Knot a hook into the center of this length of leather so you can hang the finished piece in your budgie's cage. Tie the other six pieces of leather onto the body evenly so three legs are on each side, a few centimeters apart. Slide five beads onto each leg and tie a knot at the end of each to keep the beads on. Your budgie will love sliding the beads along the legs of his new spider toy.